Yesterday's wind storm did me some damage. Not as bad as the local building pictured above, but my shingles are done. On the house, where I've never had roof problems. I'm going to have to come up with the deductible* to get that fixed. If I'm not mistaken, that's $1500, and I'm not sure if I then have to pay a percentage of the repairs or not. I'll be talking to the insurance people soon, although I expect they'll be very busy for a while. It was quite a day. Please share this anywhere you believe would help. I'm posting this from my phone because the power hasn't been restored yet, so it may take a while to hear from me. I'm ok because I'm a prepper. I'll update this post and answer questions once I have power and internet again. Until then, thanks. UPDATE: Just got power back. It was off 15.5 hours, which is probably a record for me. I actually enjoy power outages, though. Yesterday was the shingle-apocalypse, and not just for me. I saw shingles flying past most of the day. I once looked outside just as a house a block or so over had 6 or so shingles take flight. It looked like those videos of a tornado hitting a house, but without a tornado, and with only shingles. My yard is covered in shingles, but most are probably not mine. I'm assuming mine are somewhere east of here. Oklahoma, perhaps. I drove around the area yesterday evening and there is a lot of shingle damage, and quite a few broken trees. 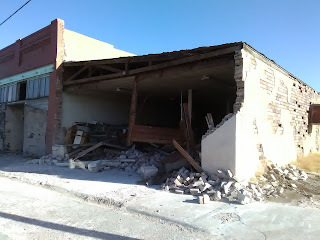 And, the wall on that one old building collapsed as you can see in the picture above. I even saw some metal roofing peeled back on some old agricultural buildings. Oh, and the "arms" of the railroad crossing blew off, too. There was no "storm". No clouds or rain or anything like that; just wind. Lots and lots of wind. With some dirt. In the early afternoon I walked the 7 blocks to my parents' house-- straight into the wind. That was probably the hardest time I've ever had walking. I was stumbling and taking the occasional step backwards to keep from falling. I'm sure I looked drunk. I couldn't keep my duster snapped. The wind kept pulling it open. I had a hand on my hat and was mostly staring straight down. I would glance ahead frequently, but my face would be pelted with gravel and other debris. I needed to see ahead to dodge shingles and other projectiles. It was interesting. My mouth was gritty for a while after I got home. I'll be out doing some cleanup as soon as it's a little warmer. At least there's not supposed to be any serious wind today. *Update #2-- I spoke to the insurance agent today. She said the deductible just gets subtracted from any payout, so there's no out of pocket there... however... with depreciation and such she thinks it could still be very expensive for me to get the repairs needed. How expensive? I'll see once the adjuster makes it to the house for a look and does his thing. Notice the shingles scattered about. They probably weren't all mine. As I've said, lots of houses in town lost shingles and I saw many of them flying past my house all day. I got up on the roof and made pictures of the damage. My neighbor says the "official" wind speeds were in the 70 MPH range, with gusts around 100. I don't know, because I don't listen to the "news", but it was impressive. It was like a dry hurricane. I got a call from the company who assigns the adjusters, with his contact information and an assurance he'll call within 48 hours. I'm now waiting for him to call and make an appointment. I assume they are very busy.